On the Nintendo Treehouse, we got a surprise announcement of yet another Metroid game to apparently make up for the recent drought with Metroid: Samus Returns. 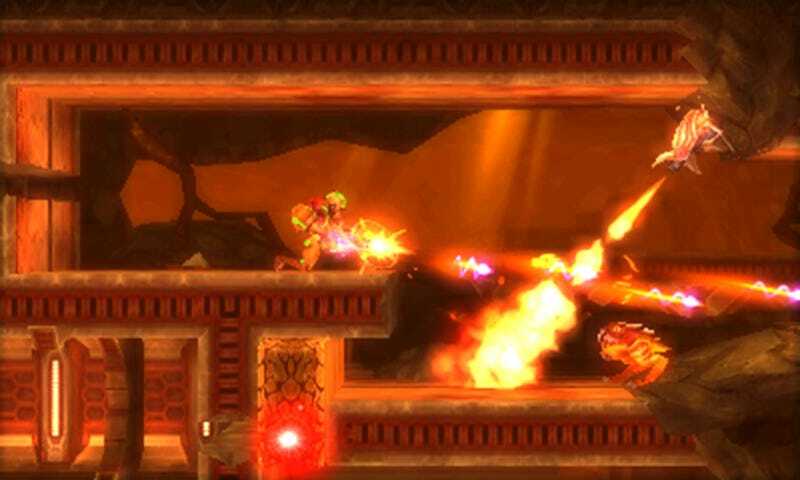 From the perspective of someone who has never beaten a Metroid game, this one looks like a great place to start. It’s a remake of the GameBoy game Metroid II: Return of Samus, so it should be easy to catch up on the story by simply reading a synopsis of the original (I don’t feel that much guilt because I’m sure most of the story from the original was put in the manual anyway, being an NES game). Not only that, but the gameplay looks genuinely fun! The portions of the gameplay that they showed off on the Nintendo Treehouse stream looked difficult, to be sure, but it seems like they’re including conveniences expected from a game in 2017 while still keeping the original game’s difficulty intact. But, despite all that, I couldn’t help lamenting the fact that the game was on 3DS and not Switch. I love my Majora’s Mask edition New 3DS XL, to be sure, and it’s had some fantastic games over the years, but ever since the Switch came out as both a console and a handheld, it’s been frustrating to see games still coming out on this non-HD handheld. The game looked fine graphically on the Treehouse stream, but it wasn’t anything to gawk at. Watching the Metroid: Samus Returns trailer in 3D reminded me how the 3DS can look stunning in a way that no other video game system can. Seriously, this game might have some of the best 3D effects I’ve seen on 3DS. Everything just pops, and the contrast between the background and foreground make me never want to look away. I watched the trailer online once. I’ve already watched it thrice on 3DS, and I want to watch it some more. It’s easy to download. Just go to the 3DS eShop and scroll right until you get to the Metroid: Samus Returns download. Select it, download for free, wait a minute for it to download, and you’re good to go. Do it now.